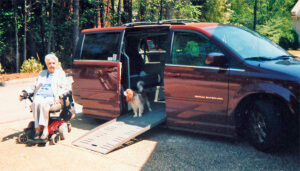 I spent a little time a couple weeks ago talking with Doris Hutchins, a very satisfied customer from Birmingham, Alabama, and was reminded what a truly transformative experience restoring freedom with the purchase of a wheelchair van can be for an individual. Doris described herself as" quite limited" in her ability to enjoy life outside her home ten years ago. She requires the use of a wheelchair as well as an oxygen tank, so leaving the house required a lot of packing, unpacking and planning. Then a friend recommended she get in touch with her brother, the owner of Sylacauga Handicap, Inc. in Alabama who also happened to have MD. She visited the dealer and was especially impressed with the BraunAbility Entervan. A decade later she describes her life as, "Free! Free! Free!" 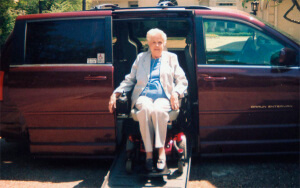 Doris recently purchased her third wheelchair van-this one a Chrysler Town and Country with a DVD system and leather seats-and describes the vehicle as, quite simply, "The Ultimate!" Doris especially appreciates the new independence her wheelchair van has brought to her life. She volunteers at her church three mornings a week and goes on regular shopping and dining trips. Her Entervans have even taken her across the country on vacations, most recently a three-week trek from her home state of Alabama to California. "I even went on a trip to both rims of the Grand Canyon and on a trip across Canada," she adds. To keep up with her love of travel, Doris needs a wheelchair vehicle that is comfortable and dependable - and she's found both in her BraunAbility Entervan. "We've had no problems with our vans, and they've certainly been very reliable and improved my independence," says Doris. "I pass along a big THANK YOU for the service you provide!" I'd like to extend a thank you right back to Doris for reminding all of us at BraunAbility what a difference our products make in restoring freedom to the daily lives of our customers. We hope our wheelchair vans will be with you on many more journeys, whether across town or across the country!